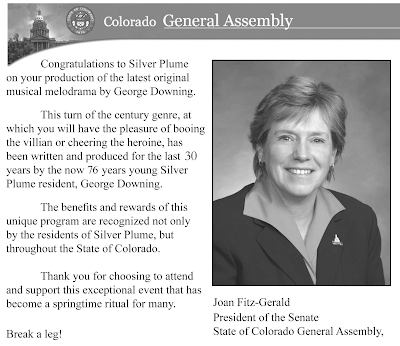 The Town of Silver Plume has, well, that is, er, our, now 79 year old citizen and playwright, George Downing, and his fearless local troupe, have produced an original melodrama used to raise match funds for historic buildings within our National Historic District - for the last 32 years - someone had to do it, the Feds have their own problems . Oh, and did I mention that the melo did start as a bake sale, circa 1977. We are asking to give you a full page in our 32 page program distributed to about 800 attendees in nine performances, if you will but write us a paragraph of congratulations, or encouragement, or, as you will - plus a digital photo of yourself (OK, Doug, I mean that Udall guy) and the digital artwork of the Seal of your domain - to my gmail address. We just might throw in a couple of tickets. I attach herewith a PDF'd example page by Joan Fitz-Gerald, who really should have been our next member of the House - sorry, Jared. Still looking for help and encouragement from Dan Gibbs, Mike Bennett and the Polis character (nice computer recycling! ), if you can encourage them. Or forward this email. By the way, I am blogging this note on our humble melodramadic melodrama blog (as a form of encouragement aka graymail) which will give you even more info and photos on our humble effort. It's 8.30 pm, Thursday (or Tuesday) night. The lights are on at the large Town Hall (aka the Downing Playhouse) at deep, very deep! far left. Playwright and director, George Downing hard at work. Brianna Regester is studying her, hmmm?, lines, background.
. . . the four Graces - l/r: Joanie Gosse, Claudia Cupp, Cheryl Heilmann and Sarah Walen following George's every nuance.